This medical complaint letter is filed against a health insurance company. On _(date)_, I submitted a claim for _______________. 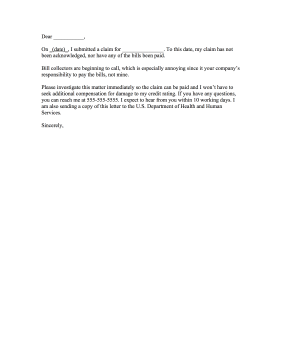 To this date, my claim has not been acknowledged, nor have any of the bills been paid. Bill collectors are beginning to call, which is especially annoying since it your company's responsibility to pay the bills, not mine. Please investigate this matter immediately so the claim can be paid and I won't have to seek additional compensation for damage to my credit rating. If you have any questions, you can reach me at 555-555-5555. I expect to hear from you within 10 working days. I am also sending a copy of this letter to the U.S. Department of Health and Human Services.